Keep finding ways to spend American miles on long haul flights in premium cabins. The pending devaluation means you'll be fighting for the same space against more people. Good luck and stay persistent. Cold in Denver, so I was day dreaming of warmer travel. Just don't fly Thanksgiving week. The large numbers of amateurs will be immensely frustrating. I would gladly pay £70 to skip all queues at LHR, but the $105 only gets you out of the passport line. United Kingdom’s Registered Traveller Service gives users a faster immigration experience, similar idea, but different process, to Global Entry. I don't fly to the UK often enough to make this worth while. Also on my last two visits, the immigration line was one or two people long. Lower Manhattan looks close, but it isn't. 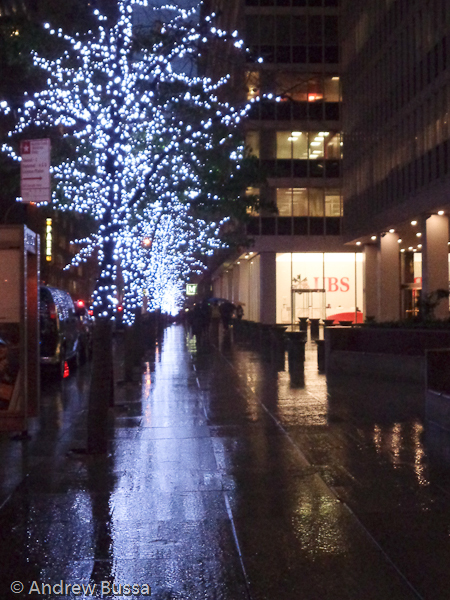 It looks nice, but the sidewalks are sticky. 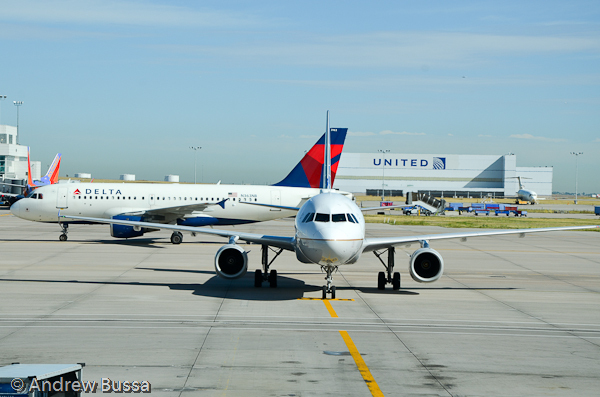 You'll earn fewer miles for flying, miles will be worth less when buying award tickets, and the program will be more like Delta and United. Not surprising or welcome news. Cash in your miles while they still have their current high value. Good luck, everyone else will be going after the same limited space on Qantas or Finnair. Don't bother. This is a miserable value. Darn. I heard the rumors that Starwood was for sale, but I was betting on a small chain like Hyatt or private equity to buy them. Starwood announced today that Marriott would be acquiring them. I don't like this for a few reasons. I'm two years away from lifetime platinum status and it's likely that this benefit won't continue. I also get Marriott status from their United partnership, so I will lose a back up program and there will be tons of extra elites fighting for upgrades and awards. Marriott's awards program isn't as generous and provides worse value than SPG. Ultimately I like my SPG program as it is and don't want it changed. If I wanted to be a Marriott elite member, I would be. Premium economy is a class between economy and business class, but is it a step up from coach or a step down from business class? 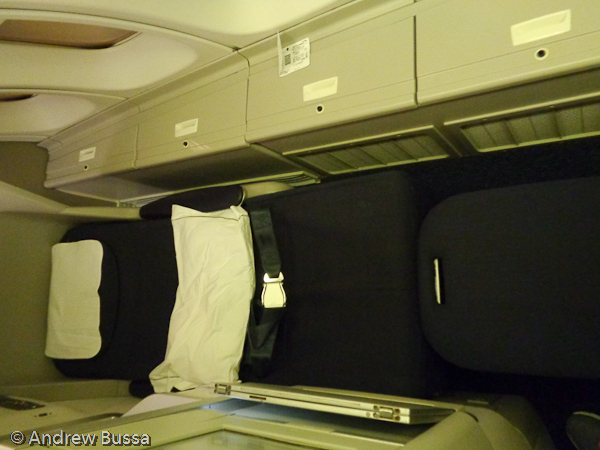 The Qantas A380 upper deck has business, premium economy, and economy seats; 6, 7, and 8 seats per row respectively. 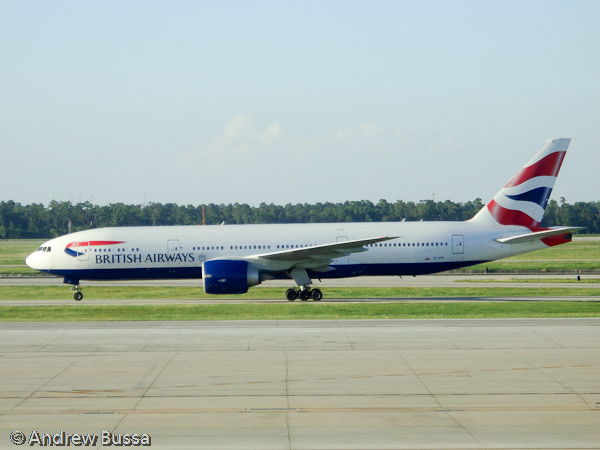 A British Airways 777 has 8 wide premium economy and 9 wide coach. The cabin is like economy in most ways. There is no lounge access and the seats reline far, but are not close to flat. The food service is improved, but still a single course. The drink menu is the same as coach and the business class bathrooms at the front of the cabin are roped off. 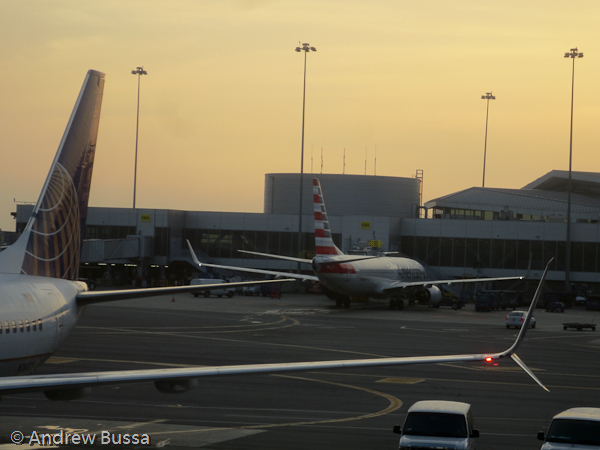 Luggage isn’t expedited, general security lines are used, and passengers are directed to the general check in line. This is definitely an improved economy experience and not a Spartan business class service. 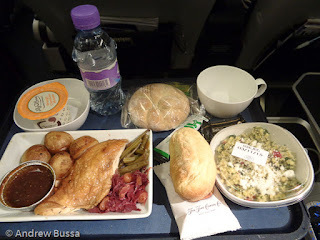 I enjoyed my British Airways World Traveler Plus experience. 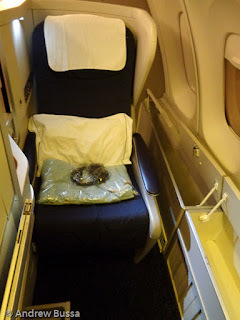 I was originally booked on a 747-400 with the first version of premium economy. I misconnected in Heathrow because of a 4 hour fog delay. The delay was great, the Captain invited passengers into the cockpit to chat and kill time; it was a wonderful and rare experience. I was rebooked on a 777-300ER to Houston with the new cabin style. The service is the same, but the TV is better, there are more power outlets, and other little enhancements. I barely made the flight and was greeted with an offer of OJ or Champagne. I settled in to my seat in the last row with limited, though still ample, recline. The TV was large and clear and the seat next to me vacant. I settled in and enjoyed the meal service. Bar options are the same as coach, Red Label rather than Black Label. The seat was comfortable for the 10 hour trip and I landed in Houston refreshed. As an added surprise, my luggage made it with me to Houston (United left it in Houston for the night while I went to Denver). 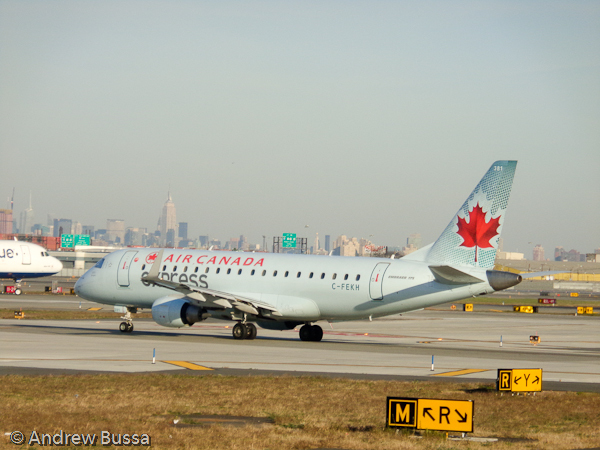 Good trip and a great option when business class can’t be booked. It’s also a great upgrade option, often $300ish dollars more than coach one way. If you set your expectations that it’s an improved coach, you’ll be delighted with the value. 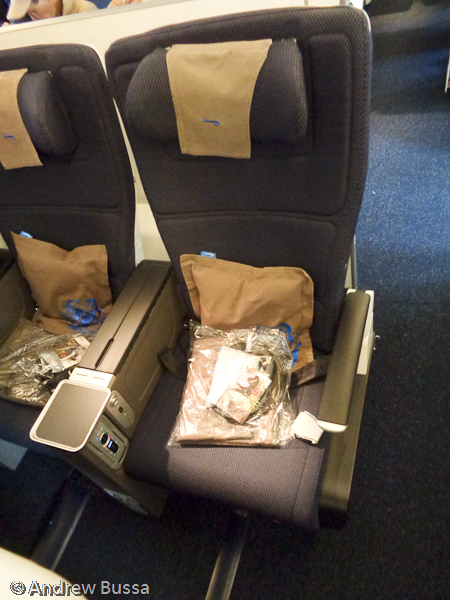 Premium cabin award space to Australia exists! Not on Star Alliance and Sky Team will send you via China or Korea (I couldn't find one day with space on Virgin Australia), but oneworld has direct space on Qantas. There isn't much, but a few days a month have a business class seat and first class space is available once every month or two. It's worth planning a trip around space availability to not go in coach or via Asia. The AAdvantage award chart to Australia / New Zealand is very good value. Almost too good. I wouldn't be surprised if prices are raised soon actually. 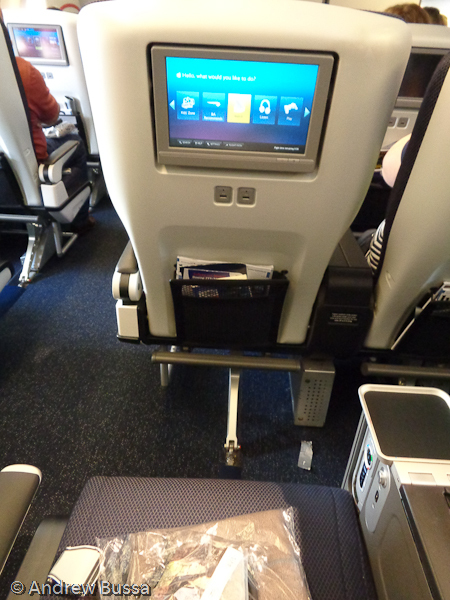 One way in business class is 62,500 and first is 72,500 miles. 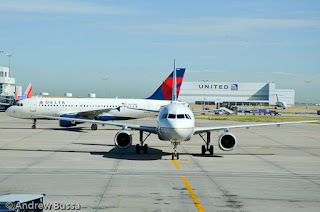 Delta charges 80,000 miles for business class and United and Air New Zealand don't have premium cabin space, so their quoted fare is meaningless. Book a ticket while you can. 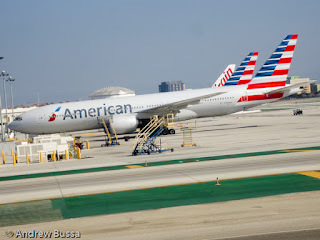 American also permits members to hold award tickets for free, so place the flight on hold while you assemble the rest of your trip to go with the premium cabin leg. Going to Australia? Going Coach. 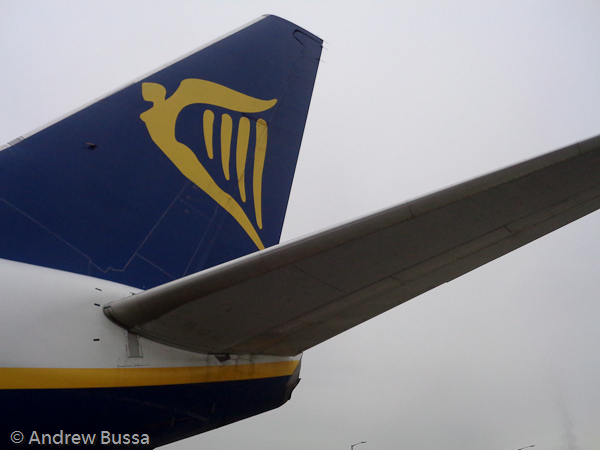 No one ever says anything nice about Ryanair. News stories always focus on how awful they are to customers and what miserable management they have. Then the news story paradoxically ends that Ryanair is the most flown airline in Europe. Ryanair's popularity always seemed strange if they were with anti-customer pariah that should be shut down by regulators. I flew them from EDI to DUB two weeks ago and it was fine. I booked the Business Plus fare type and paid $107. The Business Plus fare included a checked bag, seat selection, ticket flexibility, a free boarding pass at the airport, and a few other items I didn't use. 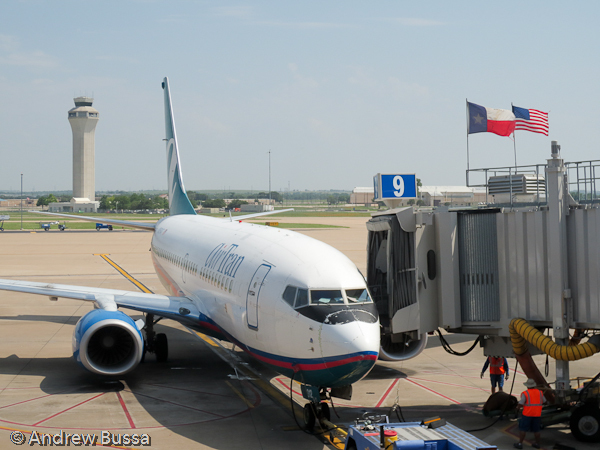 This was about a $60 premium over the basic fare, but it was about a wash after adding bag and seat selection fees. On board I had an exit row seat that did not recline (like every seat). 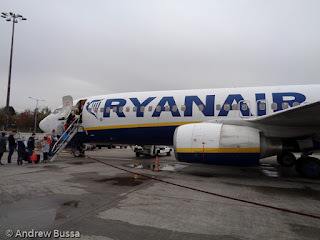 The leg room was good and the flight landed on time (Ryanair is the most punctual airline in Europe). I didn't order any food or beverages in flight. The experience surpassed my diminished expectations because the crew was friendly and nothing bad happened. There is a noticeable service difference between Ryanair and legacy European carriers, but with tickets starting a $12, people should not even expect punctual flights. 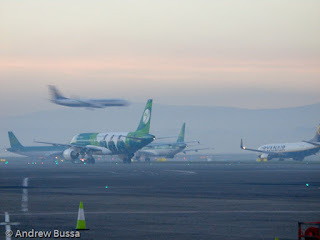 I had a four hour delay in Dublin last week due to fog in London. I enjoyed it even though I missed my connection to Denver. 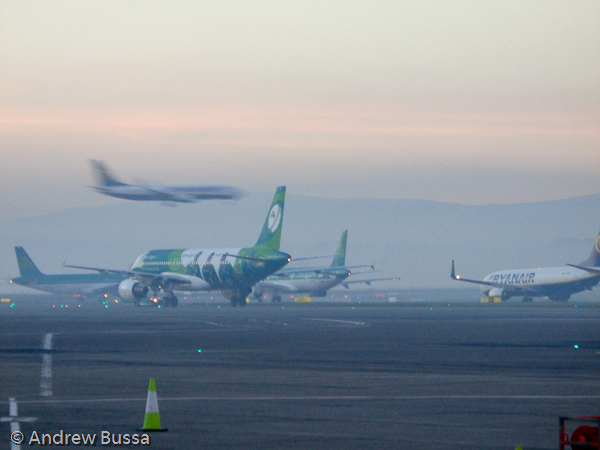 There was great morning light and a little haze in Dublin and it made for great pictures. 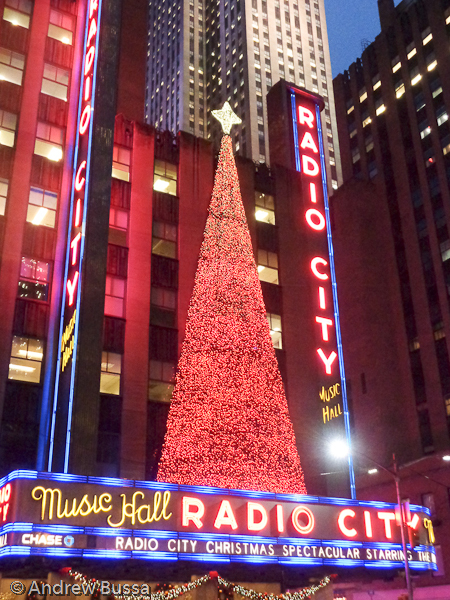 Tis the season for Christmas movies. I don't particularly like Love Actually, but it does have a good opening sequence showing the arrivals hall at London Heathrow in 2003. Having been through there two weeks ago, I can say it's much different. The only people looking at passengers coming out of customs are drivers. Friends and family are still around, but they are spread out and staring at their smart phones. Interesting how things change so quickly. I had about 100,000 British Airways miles to start the year, mostly left over from buying money for credit card points. 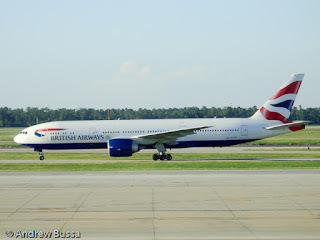 I wanted to spend my miles before British Airways devalued their award chart (advanced notice to members helped me save their value) and booked a trip to the UK and Ireland. I would go business class over and premium economy back. 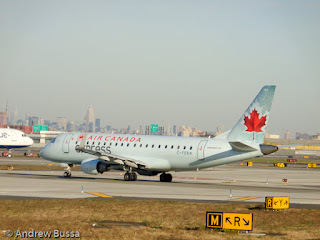 I had the miles for round trip in business, but wanted to try a true premium economy product (Premium economy review). I booked on BA.com and payed a large fuel surcharge fee. 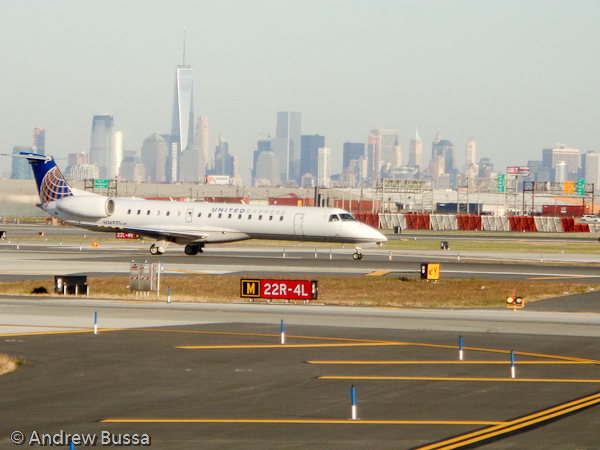 I didn't mind because this was my best shot at an interesting looking business class. 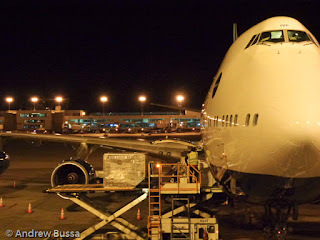 I flew on a 747-400 from Denver to London Heathrow. BA has a strained relationship with the 747. 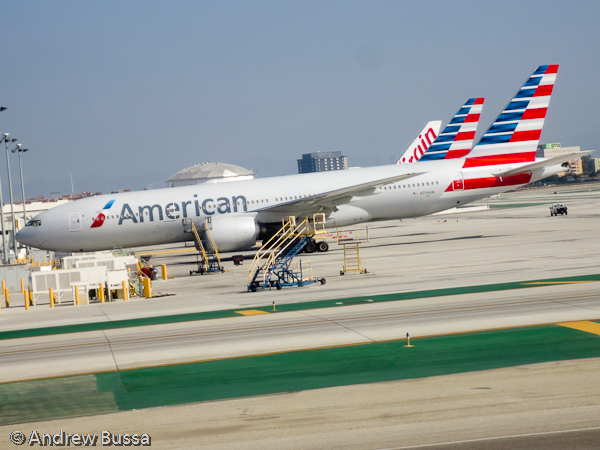 It was the long haul workhorse for many years, but they are retiring the fleet for 777, 787, and A380 aircraft. There are already a dozen or more in the desert being scraped. 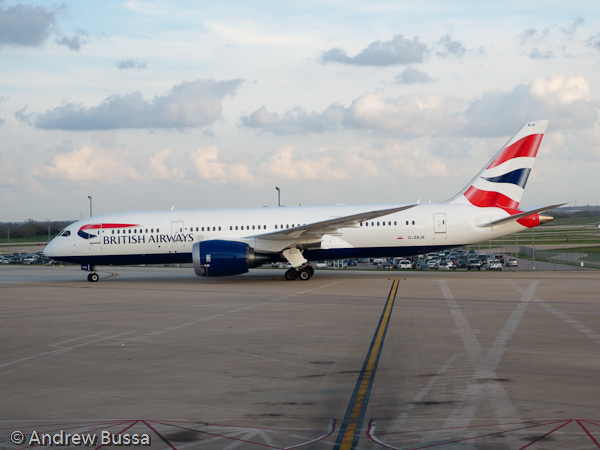 Since the fleet is being retired, BA is understandably not updating the interiors or going beyond basic maintenance. That was until I read yesterday that 18 747's will be upgraded with more business class seating (and less economy) and new TV screens. 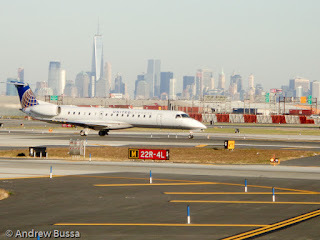 Great news once the upgrades start, but I flew on one that was, at the time, slated for parting out. The lack up upgrades was evident. The aircraft interior looked tired, almost worn out. The TV system had an older, low def, flat screen with some bright hot spots scattered about. 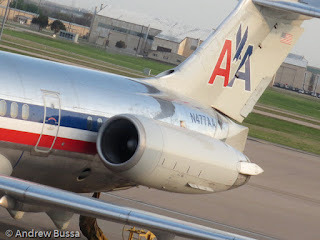 The aircraft also needed a good vacuuming and a cleaning crew with more attention to detail. Once settled in my rear facing seat, it was comfortable and drinks were served as doubles. The dinner service was pleasant and ended about two hours after take off. This left me not tired with 5 hours until breakfast and landing. I took a trip down stairs to stretch and make small talk with other people who couldn't sleep. The crew had some whiskey bottles and light snacks left out for the business class cabin at the bottom of the stairs by the second door. I enjoyed making myself a drink and munching to pass the time. Eventually I went back to my seat and got a short and restless nap in before breakfast. 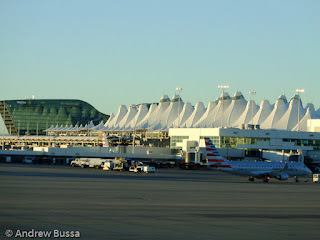 The Denver flight arrived at LHR terminal 3, so customs was a breeze and I had a quick bite at the AA arrivals lounge (nothing like BA in terminal 5 of Lufthansa) before hopping the underground into London. Good trip, but it showed that BA was not giving maximum effort on the Denver flight.